Background: Absence from work for health reasons is known as “sickness absenteeism”. Frequent sick leave is a major concern to any organization, especially hospitals. Objective: This study analyzed the extent and causes of sickness absenteeism in a teaching hospital and evaluated its corelation with demographic and occupational factors. Methods: In a cross-sectional study, data was extracted from computerized records regarding sickness absenteeism of healthcare workers (HCWs) in the Occupational Health Department of a teaching hospital in Tehran. Studied variables included demographic characteristics, occupational factors, and causes of sickness absenteeism. The sickness absence rate (SAR) and absence frequency rate (AFR) in the study period were calculated. Chi-square and Mann-Whitney tests were used for the comparison of categorical and quantitative variables, respectively. Results: In the current study, SAR and AFR were 0.011 and 0.68, respectively. Job type was the only factor that had a significant correlation with sickness absenteeism. The major disease-causing sicknesses were flu (21%) and musculoskeletal disorders (18.9%). Conclusion: A significant relationship was found between the nursing group and sickness absence episodes. Flu, musculoskeletal disorders, and infectious diseases were the most frequent causes of sickness absence. Based on these findings, it can be concluded that factors such as availability of the flu vaccine and providing principles of personal protection and infection control can reduce sickness absence due to infectious disease. North F, Syme SL, Feeney A, Head J, Shipley MJ, Marmot MG. Explaining socioeconomic differences in sickness absence: the Whitehall II Study. BMJ. 1993;306(6874):361-366. doi:10.1136/bmj.306.6874.361. Schreuder JA, Roelen CA, Koopmans PC, Moen BE, Groothoff JW. Effort-reward imbalance is associated with the frequency of sickness absence among female hospital nurses: a cross-sectional study. Int J Nurs Stud. 2010;47(5):569-576. doi:10.1016/j.ijnurstu.2009.10.002. Hanebuth D, Meinel M, Fischer JE. Health-related quality of life, psychosocial work conditions, and absenteeism in an industrial sample of blue- and white-collar employees: a comparison of potential predictors. J Occup Environ Med. 2006;48(1):28-37. doi:10.1097/01.jom.0000195319.24750.f8. Kivimaki M, Head J, Ferrie JE, Shipley MJ, Vahtera J, Marmot MG. Sickness absence as a global measure of health: evidence from mortality in the Whitehall II prospective cohort study. BMJ. 2003;327(7411):364. doi:10.1136/bmj.327.7411.364. Sepkowitz KA. Occupationally acquired infections in health care workers. Part I. Ann Intern Med. 1996;125(10):826-834. doi:10.7326/0003-4819-125-10-199611150-00007. Dement JM, Epling C, Ostbye T, Pompeii LA, Hunt DL. Blood and body fluid exposure risks among health care workers: results from the Duke Health and Safety Surveillance System. Am J Ind Med. 2004;46(6):637-648. doi:10.1002/ajim.20106. Fong YF, Cheng WM. Sickness Absenteeism Among Nurses of a Hospital. Hong Kong Practitioner.1991;13(5):1465-1475. Wright E. Sickness absence. In: Agius R, Seaton A, eds. Practical Guide to Occupational Medicine. 2nd ed. Edward Arnold Ltd; 2005:186-219. Khawaja RA, Sikander R, Khawaja AA, Jareno RJ, Halepota AT. Medically certified sickness absence among health care workers. J Pak Med Assoc. 2012;62(9):900-904. Mohseni Saravi B, Kabirzadeh A, Rezazadeh E, et al. Prevalence and causes of medical absenteeism among staff (case study at mazandaran university of medical sciences: 2009- 2010). Mater Sociomed. 2013;25(4):233-237. doi:10.5455/msm.2013.25.233-237. Ferreira RC, Griep RH, Fonseca Mde J, Rotenberg L. A multifactorial approach to sickness absenteeism among nursing staff. Rev Saude Publica. 2012;46(2):259-268. doi:10.1590/S0034-89102012005000018. Pines A, Skulkeo K, Pollak E, Peritz E, Steif J. Rates of sickness absenteeism among employees of a modern hospital: the role of demographic and occupational factors. Br J Ind Med. 1985;42(5):326-335. doi:10.1136/oem.42.5.326. Cohen-Mansfield J, Rosenthal AS. Absenteeism of nursing staff in a nursing home. Int J Nurs Stud. 1989;26(2):187-194. doi:10.1016/0020-7489(89)90034-5. Heijbel B, Josephson M, Jensen I, Vingard E. Employer, insurance, and health system response to long-term sick leave in the public sector: policy implications. J Occup Rehabil. 2005;15(2):167-176. doi:10.1007/s10926-005-1216-x. Martinato MC, Severo DF, Marchand EA, de Siqueira HC. [Absenteeism in nursing staff an integrative review]. Rev Gaucha Enferm. 2010;31(1):160-166. doi:10.1590/S1983-14472010000100022. 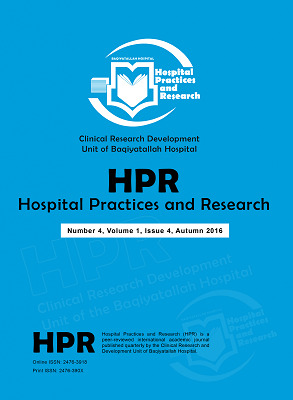 Izadi N, Sadeghniiat Haghighi K, Malek M. The Results of Medical Surveillance of Health Care Workers by the First Hospital Occupational Health Clinic. J Mil Med. 2015;17(2):73-79.